Oak Canyon Ranch, 5305 Santiago Canyon Rd. This is a Super event held here in Southern California and if you can make it, you will be so stoked that you did. This started off a s a tint get together about 2009 and my old room mate Grant Peterson and his buddy have molded this little get-to-gether, into one the most popular Motorcycle events on the Calendar and it grows from strength to strength. People from all over the globe attend this infamous Chopper cult show and the friendly atmosphere is just awesome, plenty to see, there is eye candy in every direction. There will be special invited builders that are known for their own flair of bike, as well as young guns just getting into this industry, if you can make it here to Southern California, then this is the time to come down, enjoy the weather, enjoy the show, enjoy the people and their machines. So-if you are into 2 wheeled machines and especially Choppers, then this is going to blow your mind. 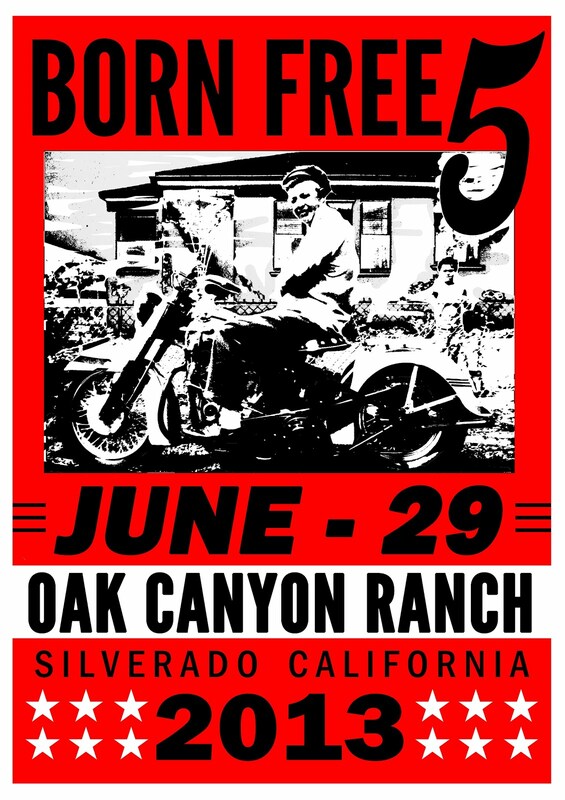 bornfreeshow.blogspot.com The Born-Free Show is about the love of old motorcycles and like-minded individuals having a good time together and enjoying these bikes of the past. A family event catering to all age groups. Only a day away! Some info for those of you coming out. NO PETS. NO COOLERS. NO CLUB COLORS PLEASE. LOOK FOR THE SIGNS TO CAR PARKING & BIKE ENTRY. PLEASE RIDE SLOW ENTERING THE EVENT and LASTLY PLEASE RESPECT THE EVENT SITE, WE TREAT IT LIKE IT’S OUR OWN HOME…PLEASE DO THE SAME. THANK YOU FOR YOUR SUPPORT! The show is FREE to ride into. You can register your bike at the Born-Free booth once you’re in. The show is mainly about old motorcycles of all kind, but everything is welcome. We’ll have limited parking for those of you riding in on new stuff. See you Saturday! This show is meant to unite people from all walks of life by bringing the passion that we all have of these old machines together for one special day. 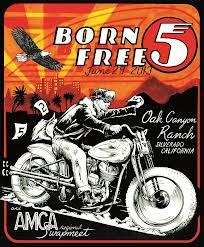 Born Free is a collaboration between BORN Loser (Mike Davis) and FREEdom Machine & Accessories (Grant Peterson). Started as a small “get-together” in 2009 the show has grown to become the premier chopper show on the west coast bringing fans and enthusiasts from around the world. This entry was posted in Blog and tagged BSA, cb750, chopper, custom, drag, event, harley, Honda, kawasaki, motorcycle builder, rally, suzuki, triumph.